Dr. Bob Fisher makes the announcement that Belmont is acquiring Franklin-based OÕMore College of Design, bringing new programs in fashion and interior design, as well as fashion merchandising, to this campus in an announcement by Shari Fox and Dr. Bob Fisher at Belmont University Nashville, Tennessee, February 13, 2018. 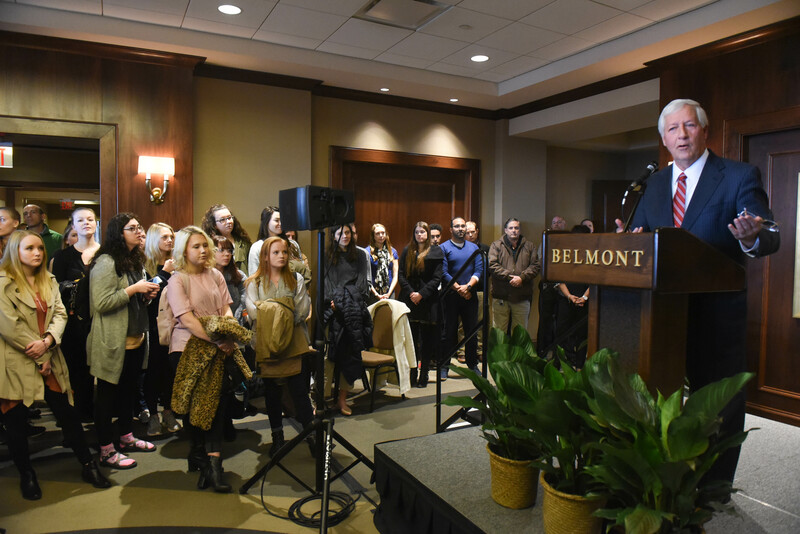 In a timely move that enhances Belmont University’s academic and professional offerings in design while extending the strong legacy and reach of O’More College of Design, the two institutions announced today that they are combining efforts to serve the next generation of designers. The governing boards for both Belmont and O’More have agreed that Belmont will acquire O’More College of Design and all of its assets and then move O’More’s programs in fashion, interior and graphic design as well as fashion merchandising to Belmont’s campus. The new O’More School of Design at Belmont University will open its doors this fall in Nashville. The news is all the more fitting as O’More’s roots lie with a Belmont alumna. O’More College of Design was founded in 1970 by Eloise Pitts O’More, a Ward-Belmont graduate who also trained in Paris and New York for interior design. Her goal was to establish a school that would foster and preserve her passion for design and design principles. With an aim to provide a student-centered environment that cultivates the power of design to transform, O’More has been recognized by Fashion-Schools.org as one of the top 10 fashion programs in the South and the only Tennessee program that is nationally ranked. Fashion businesses in Nashville contribute $5.9 billion and 16,200 jobs to the area’s economy. The report suggests those numbers could reach $9.5 billion and 25,000 jobs by 2025. O’More offers the only BFA Interior Design program in Middle Tennessee to be fully accredited by the international Council for Interior Design Accreditation (CIDA). O’More’s Interior Design department boasts nine winner of the Angelo Donghia Foundation Scholarship, the nation’s most prestigious interior design scholarship. As consumers’ expectations increase for homes and offices that are environmentally friendly and more easily accessible, Belmont programs in areas like health and environmental sciences will offer timely collaborations. The creative climates fostered at both schools, along with kindred missions focused on transformative and service-minded education, translates to a powerful pairing. In addition to the financial stability, resources and expanded reach Belmont offers, the union provides O’More students with an array of opportunities not currently available, including campus housing, study abroad possibilities, dedicated career development staff and increased options for general education courses. Students at both institutions will benefit from immense cross-discipline collaborations as fashion designers work with musicians on stage outfits or interior designers meet with the theatre department to discuss set scenery. Other programs at Belmont—like law, entrepreneurship, marketing, health sciences and many more—will all quickly discover mutually helpful connections with students in O’More’s programs. The O’More School of Design at Belmont University will be housed within the College of Visual and Performing Arts.